For impressionable children, close encounters with wildlife just might carry more enduring lessons about a serious illness than any classroom lecture. JEFFERSON — What happens when a grassroots, community-based nature center joins forces with a wildlife research institute? 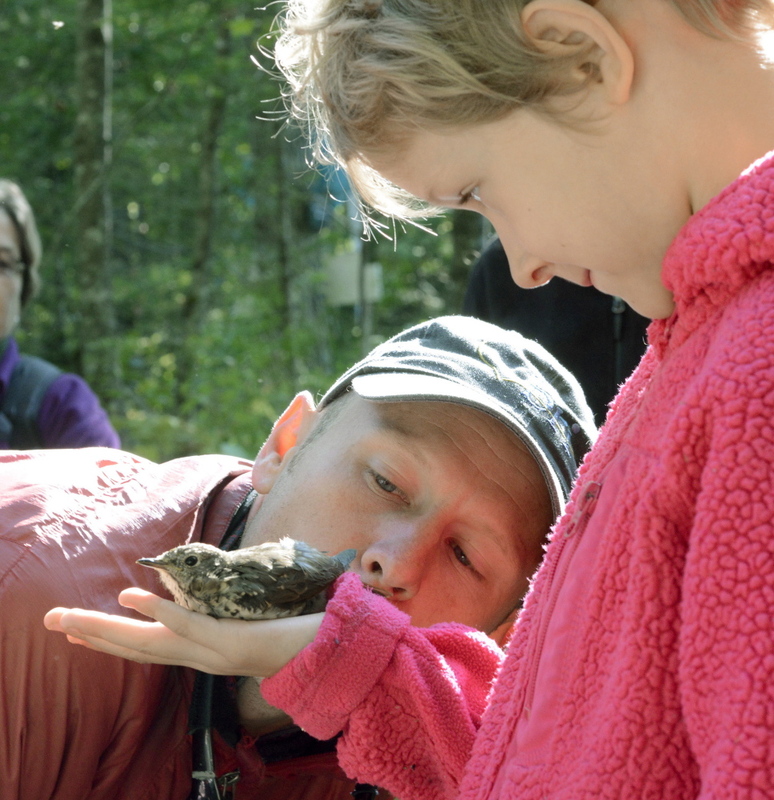 At least one day last week it offered grade-school children the opportunity to hold wild songbirds in their hands. Said another way: It meant a once-in-a-lifetime moment in nature. “He might not have talked about it now, but tonight at dinner he will, or one day next week he’ll open up and talk about that bird,” said Kristin Stone of Whitefield, whose son, Eoin O’Mahoney, released one of the songbirds at a bird-banding study Thursday at Hidden Valley Nature Center. 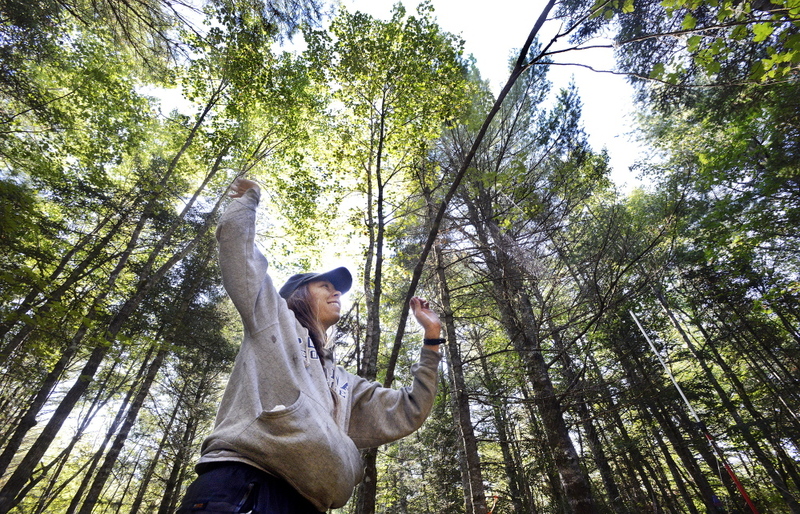 Seven-year-old Freya Drum of Damariscotta watches as wildlife biologist Patrick Keenan gently blows and urges a hermit thrush to go airborne from her hand during a banding session last week at Hidden Valley Nature Center in Jefferson. And the joy in that smile shows this will be a day to be remembered for years to come for Drum. 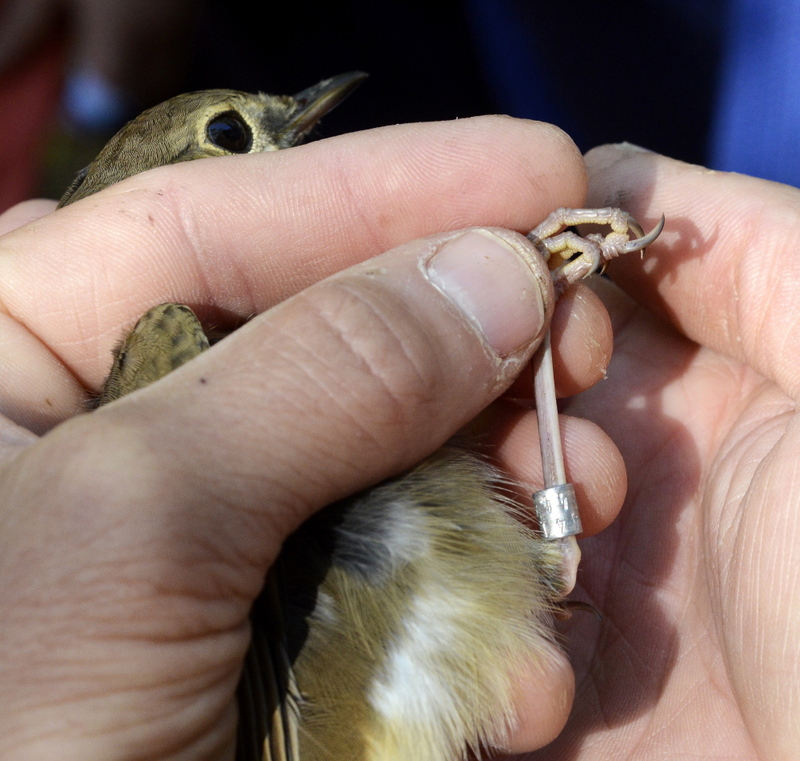 Biologist Patrick Keenan bands a hermit thrush after it underwent testing last week for Triple E. The disease is prevalent in songbirds, but most seem to handle it without ill effects, he says. • To find information on Eastern Equine Encephalitis, go to cdc.gov/EasternEquine Encephalitis/index.html. • To learn more about the Biodiversity Research Institute, go to briloon.org. • Information on Hidden Valley Nature Center programs can be found at hvnc.org. The Biodiversity Research Institute was conducting bird banding field work Thursday at the nature center as part of an ongoing study on the disease Triple E, or Eastern equine encephalitis, in order to better understand how prevalent it is in Maine. The Gorham-based institute has been studying the mosquito-borne disease that is found in migratory songbirds in conjunction with the Maine Vector Borne Disease Laboratory at Maine Medical Center. Triple E, found in people, horses and birds, is considered one of the most serious mosquito-borne diseases in the United States, according to the Maine Center for Disease Control and Prevention. Maine has never identified a case of Triple E in a human, but this year the disease killed an emu in Cumberland County, said Patrick Keenan, a wildlife research biologist with the institute. In humans the disease can cause swelling in the brain, coma, and even death. There is no known treatment for humans who contract the disease. At three test sites – in Jefferson, Falmouth and Windham – the institute’s biologists catch songbirds in mist nets, band them, gather data to determine the general health of the birds, and collect blood samples that are sent to a laboratory in Washington, D.C., to test for Triple E.
Certain songbirds – such as the hermit thrush, robin and veery – act as hosts for mosquitoes that transmit the disease, and those birds carry the disease with no apparent problems, Keenan said. Of the 130 songbirds caught and blood tested at three sites last year, 42 percent tested positive for Triple E.
Keenan said the test sites are not necessarily areas with a higher incidence of the disease; they simply offer protected land ripe with habitat that attracts songbirds. Hidden Valley Nature Center, with its 1,000 acres of forestland, offers habitat preferred by birds like the hermit thrush and veery. When Hidden Valley Nature Center opened its doors to the institute last year, Keenan came four times to net birds. This year, he again made four trips. But at the final trip last week, the nature center for the first time invited local school children to come learn alongside the research biologist. For the children, it was a rare, close-up encounter with wildlife; for the adults, it amounted to a science class on vector-borne diseases. Keenan spent over two hours introducing nine songbirds to 14 adults and 16 children. Playing the calls of the hermit thrush and veery, he attracted those species into his nets. One chickadee, which is not a target species, also ended up in a net and was put through the study anyway, despite the feisty bird’s fits and protestations. Many of the 16 children volunteered to use their hands as a “platform” to help the birds take flight again, but with only nine birds netted during their visit to the nature center, only about half got that thrill. O’Mahoney, 10, was one. He stood for several seconds with a hermit thrush in his hand, eventually putting his other hand in his pocket as he patiently waited for the bird to fly away. But it would not. Eventually, Keenan walked slowly behind O’Mahoney and blew on the bird to nudge it along. “It felt cool. I think it sat on my hand because my palm was warmer than the air,” said O’Mahoney, who is home schooled. His mother said her sons are frequent visitors to the nature center and other land trusts, but Eoin’s moment with the bird would be a lasting memory.